One of my first thoughts about moving back to Korea was ‘I can get a blender!’ A recent realization has my blender plans back on hold. Oh, I’m waiting for the day I can make smooth soup and delicious smoothies. While scrolling through ‘The Kitchn’ I came across this article about grating tomatoes to make raw spaghetti sauce. My strong desire for a blender subsided. I thought ‘I bet I can make tomato soup this way.’ So tonight the adventure begins. I grated a tomato then put some Italian seasoning to cook in a little olive oil. After adding the tomato, I put in a little honey. I left it on to simmer and get a dark red color, about 15 min. I’m excited to try the results. I’m actually so pumped I started writing before I was finished cooking. I have high expectations. Okay, wow! That’s definitely sauce, so back to the stove with you. I’m adding milk and water this time. It’s more orange than in the picture and quite delightful. It is a soup but I find myself chewing the seeds. It’s a kind of simple summer soup. I have more things to try out. I saw Gordon Ramsey using a potato masher for rustic tomato soup. That might also work for banana ice cream. 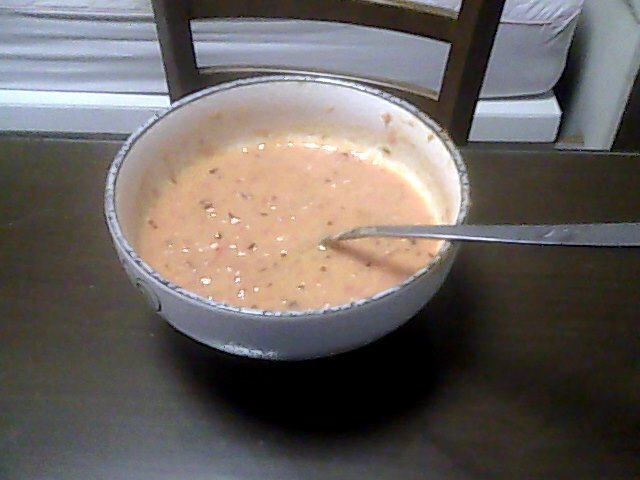 Anyway, the soup is good and I’ll probably mess with it some more. How do you like to make tomato soup?